I've been scanning negatives from my 3-month long Australia trip back in 1999 with Hiram College. Here's a shot of sulphur crested cockatoos, which were as common as crows in some areas of Australia. 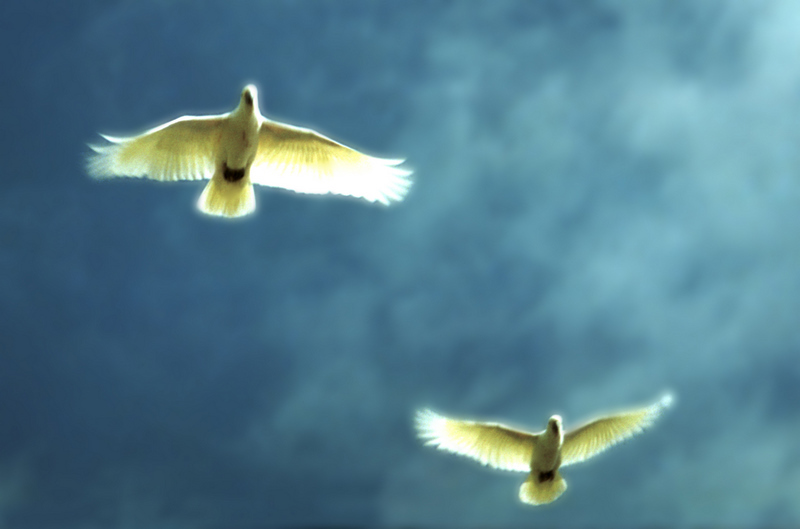 The sky was a bit grainy, so I blurred it and used a layer mask to exclude to the blur from the birds themselves. Shot on Fuji 200, using my first real camera, a Samsung Maxima Zoom. I thought this would be nice another mid-day addition to Misty-Dawn's camera critters meme. Oh, the light shining through their wings is amazing! Just gorgeous! Great shot. The background certainly looks much more seamless with the birds now than I imagine it would with grain. That is a beautiful photo! I can't imagine seeing that kind of bird flying in the wild. They look expecially relaxed in their flight. Beautiful. Oh, these are wonderful...love them. I really like the way the light is shining through their wings. What is your scanning workflow? I see these everyday where I live. There are also black ones... which aren't as common. Nice job with the image. Tom: Really neat shot of the flying birds. I posted a few more Brandywine Falls photos.